The auditors should follow attentively step-by-step this list and the result will be a final audit report with the recommended changes. After that the company implements the offered methods to improve the business process effectiveness and auditors review, test the quality and effects of the implemented changes, and then start the next cycle of audit steps. ConceptDraw DIAGRAM diagramming and vector drawing software offers you the Audit Flowcharts Solution from the Finance and Accounting Area with useful tools, library of vector audit flowchart symbols, template and a set of samples that will help auditors create visual and clear audit flowchart, audit process flowchart, chart audits in minutes. 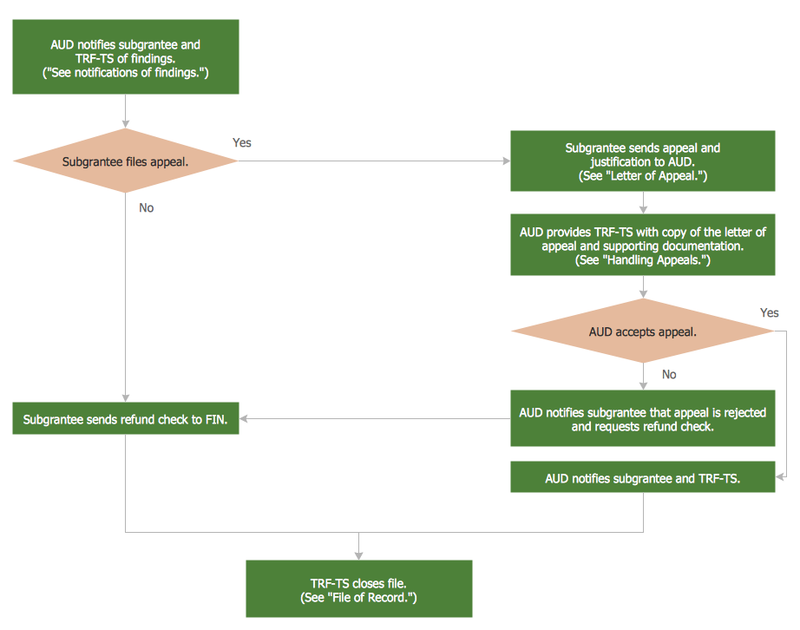 This template was created in ConceptDraw DIAGRAM using the Audit Flowcharts library from the Audit Flowcharts Solution and shows the sequence of actions in auditing process – the audit steps. It is convenient to use the predesigned templates from the Audit Flowcharts Solution as the base for your own professional looking audit flowcharts. 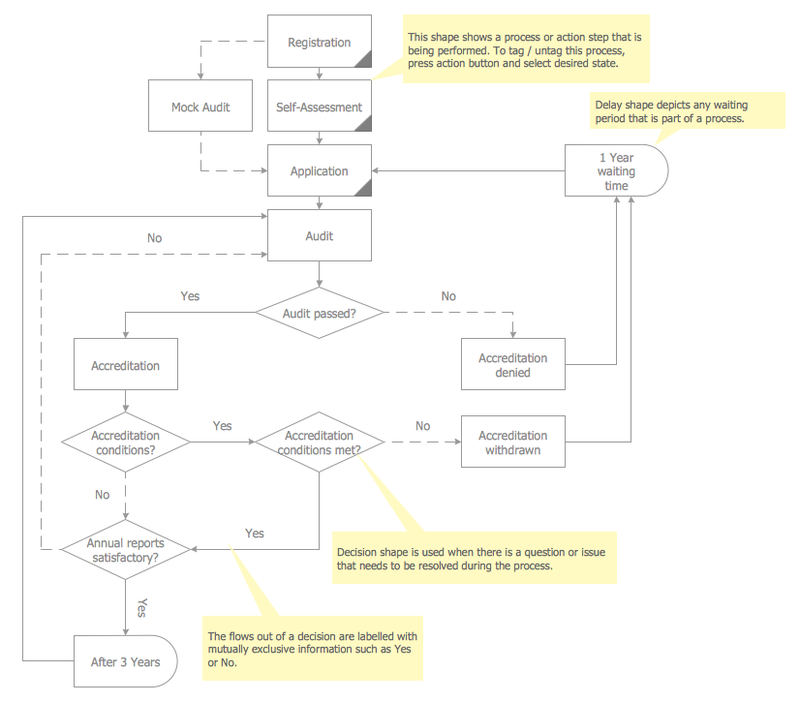 The Audit Flowcharts produced with ConceptDraw DIAGRAM are vector graphic documents and are available for reviewing, modifying, and converting to a variety of formats (image, HTML, PDF file, MS PowerPoint Presentation, Adobe Flash or MS Visio). The audit process is a definite set of steps used in a financial, operational or compliance audit. This set of steps depends of the audit services company. The auditing process usually includes three main steps: planning, fieldwork and reporting. The Audit Flowcharts solution from the Finance and Accounting area for ConceptDraw Solution Park extends ConceptDraw DIAGRAM v12 ector graphics and diagramming software with the ability of easy drawing the Audit Process Flowcharts. One of the ways effectively visualize what is a Cloud computing or Cloud computing architecture, is to create the Sequence diagram for Cloud computing. The ConceptDraw DIAGRAM v12 diagramming and vector drawing software enhanced with Cloud Computing Diagrams solution from the Computers and Network area of ConceptDraw Solution Park will help you design all desired types of diagrams related with cloud computing.